Applaws Tuna and Seabream Pouch wet food is a delicious and nutritious meal for your cat. It contains high levels of beneficial omega oils to keep your cats skin, coat, and joints in good condition. This meaty pouch contains gently tuna and anchovy in a silky fish broth. This food is a natural source of taurine and contains 75% tuna and seabream. 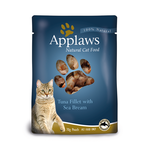 Suitable for adult cats as a complementary treat food only. This food is not registered as a complete balanced diet. Not recommended for growing kittens or lactating females. My cats love this more than any food I had be tried. Natural is best! Very good.Our cat loved all the time!